The number of school lollipop staff in Wales has fallen by almost a quarter in the past three years, figures show. As of March 2016, the number employed by local authorities fell by 170 to fewer than 600 compared to three years earlier - a drop of 23%. Many of the patrols have not been replaced by cash-strapped councils after crossing assistants retired. Road safety charity Brake said patrols played a "key role" in keeping children safe. However, there is no legal duty for councils in Wales to provide them and many have reviewed the use of crossing staff in a bid to address budget deficits. The Welsh Local Government Association (WLGA) said financial pressures and recruitment issues were making it hard for councils to fill roles - with bad weather and "commonplace" abuse from drivers putting people off. Figures obtained under the Freedom of Information Act, show all but three of Wales' 22 councils saw a reduction in the number of crossing patrol staff between 2013 and 2016. Many councils said crossings were being reassessed and scrapped when staff retired. Carmarthenshire saw the biggest cut - with 23 posts being lost since 2013. Road safety and traffic manager for the council, John McEvoy said: "A number of school crossing patrol sites have remained vacant for a long period of time due to difficulties with recruitment." In Neath Port Talbot 19 posts were lost, as the council tried to address a £17.3m deficit in 2014-15. Many schools, town and community councils, now fund patrols in the area. Seven roles have gone in Newport and the council said it struggled to recruit suitable candidates, adding it was not unusual for a vacancy to fail to attract a single applicant. Only Monmouthshire increased the number of patrols in the period, from five to eight in March 2016, while Powys employed no-one in the period. In Pembrokeshire - where seven posts have been lost due to retirement and ill health - the council reviewed the use of school crossings across the county, carrying out surveys to check their use. The authority's assistant road safety officer, Sally Jones, said the review had led to plans to cut services in the region being scrapped, and no roles were cut. A spokeswoman for Brake, said: "School crossing patrols provide a vital service by helping children cross roads safely on their way to school. "Local authorities have a duty to promote the use of sustainable transport, especially for children on their way to school, yet the number of lollipop people are declining." Eirlys Twigg started helping children cross the road in 1987. 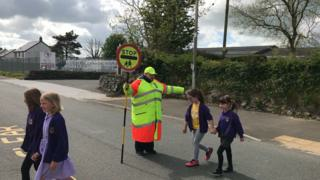 Almost 30 years later, she is still guiding school children outside Ysgol y Frenni, Crymych. Her role was under threat during the review, but she said it was saved after support from the community. "You meet the parents, you meet the children, it's something you do in the community: you are helping the community by doing this job," she said. "[Lollipop ladies] are very important for the safety of the children to cross to the school and even more important in the afternoon." Cath Charlton has been helping children cross the road in Merlin's Bridge for the last decade. 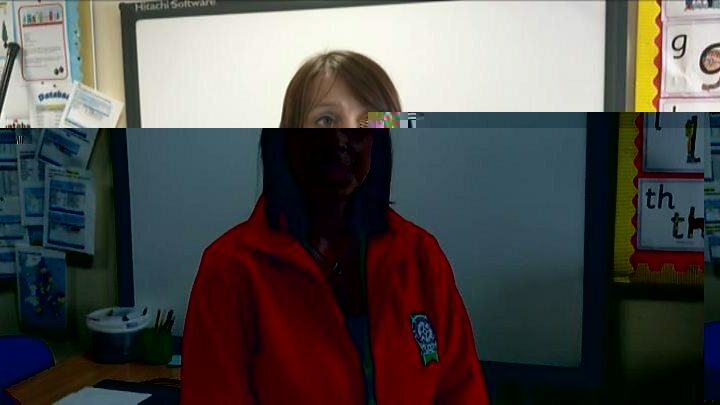 When she started, her son, now aged 21, was at the school, and she said helping the children and talking to them always made her day. "When Merlin's bridge is gridlocked and when the lanes are flooded it does get busy here, and it can be dangerous sometimes," she said. She believes if the crossing was to be scrapped children could get hurt.